How South Africa Car Rental, Leasing and Aggregator Market is Positioned? In 2013, online cab aggregators entered the South African transportation industry with the launch of Uber in Johannesburg. Uber and Taxify are the major players in the market. 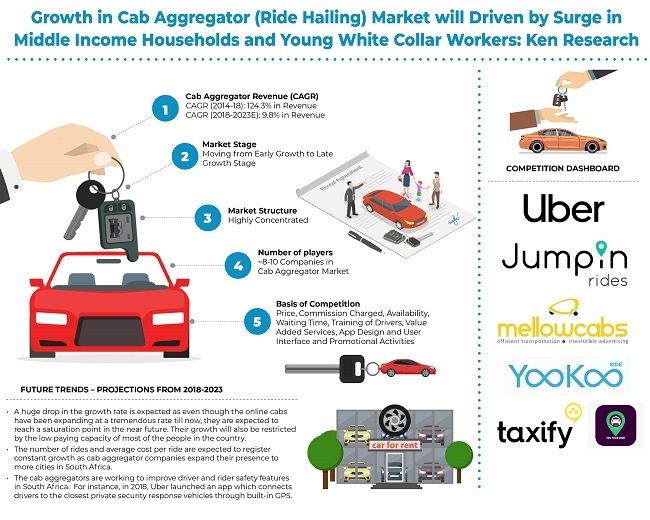 Online cab aggregators have expanded the market beyond the existing market of traditional metered taxis. At numerous occasions violence has erupted between metered taxi operators and online cab aggregator drivers in the country as the metered taxi operators accused the online cab aggregators of stealing business and competing unfairly due to low fares which could not be matched. In 2018, Southern South Africa had the largest share of the car rental and leasing market in terms of revenue followed by Northern South Africa, Eastern South Africa and Western South Africa. Cape Town and Port Elizabeth are the major markets for car rental and leasing in the southern part of the country. This is because not only is Cape Town a major destination for business tourism in Africa, it is also an employment hub in the country and thus attract many migrants. Offline booking was the major source of bookings as compared to online bookings in South Africa car rental and leasing market. Direct booking through company website had the major market share within the online booking market for car rental and leasing while booking through intermediaries mainly including booking through third party websites such as CarFlexi, Economy Car Rentals, and Kayak or by other travel agencies had a smaller share in the online booking market. In 2018, Logistics and Courier companies continued to be the largest end user for car rental and leasing market followed by Mining Company Executives. Other end users included Financial Institutions, Consultancy, Hospitality Industry and other industries. This is because a large number of businesses rely on logistics and courier companies for urgent, secure and efficient procurement and distribution solutions in South Africa thus fuelling growth in the country’s car rental and leasing market too.